Life in prison was the sentence they received even though they had not committed murder, treason or robbery. Their “crime” was having a disease which medical science now shows that 95 percent of the world population is not susceptible to. And for thousands, that “sentence” was served at a leprosarium in Carville, now known as the National Hansen’s Disease Museum. That stigma continued to more recent times in Louisiana, according to Dr. David M. Scollard, director of the National Hansen’s Disease Programs and Elizabeth Schexnyder, curator at the museum. The museum honors leprosy patients who were there and the medical staff who attended to them and made medical history. In 1892, Louisiana passed a law requiring people diagnosed with leprosy to be quarantined in a selected location. A board of control was established to run the leprosy home. They selected Indian Camp Plantation in Carville. Patients began arriving by coal barges in November of 1894. Once there, patients were quarantined for the rest of their lives. 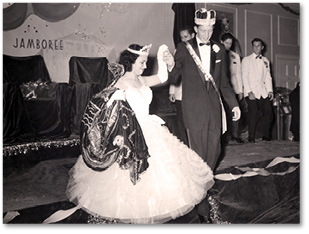 Among the social activities at the national leprosarium at Carville was a Mardi Gras ball. Located near the end of the road by a levee, patients were fearful and considered it the end of their lives. Their new homes were the slave cabins at the abandoned plantation. 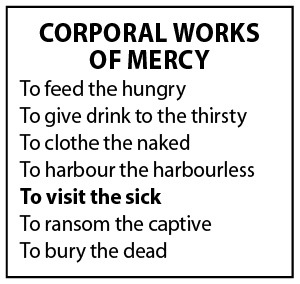 The terms used to refer to the patients were the same as those used for prisoners. Bounties were offered for those who escaped “through the hole” in the fence. They were usually punished by being jailed. Patients were occasionally allowed visitation with family members and lucky ones were paroled. Bringing a light of hope to the leprosarium, where the scourge of loneliness was acute as the disease itself, were the Daughters of Charity of St. Vincent de Paul. 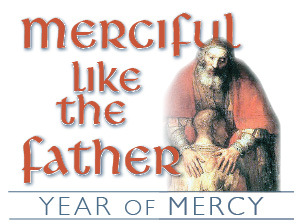 The president of the control board, Dr. Isadore Dyer, had suggested that the Daughters of Charity, uncloistered servants of the poor working where they found those in need, care for the patients. After some consultation, the sisters accepted the mission. With spartan spirits the sisters, who had the motto “The charity of Jesus Christ crucified urges us,” met almost insurmountable conditions. The biggest was the dilapidated condition of Indian Camp Plantation, which was to be their headquarters, according to Schexnyder. But they were determined to bring dignity to the patients. 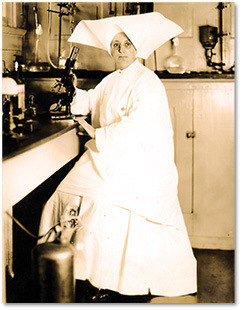 Sister Hilary Ross DC, lived and worked at the Carville hospital from 1923 to 1960 where she helped to build a research laboratory for drug testing in partnership with Dr. George Fite. “In the evening of the 16th we sailed from New Orleans and reached the plantation on Friday, the 17th. Our first move was towards the patients’ quarters, where the word leper will not be used, if possible. The patients could see the steamer arrive from their cabins and were out on the porches waiting for us. We went to each one separately and tried to make them feel we had come to be one with them, to care for them and make them happy. To look into their wants and supply them. 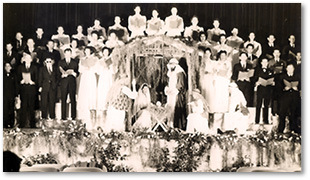 The sisters began at once to establish a sense of community. Mass was celebrated within the first 24 hours of their arrival. The first chapel was built inside one of the slave quarters and measured 26′ x 15′. Schexnyder said that not only was life at Carville made more tolerable by the arrival of the sisters, but their presence gave hope for a Christian death and burial. 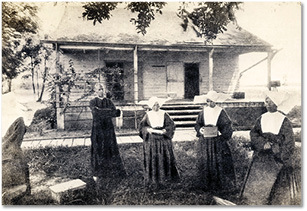 Schexnyder noted that the sisters had developed such a close relationship with the patients that they were buried alongside them in the cemetery. 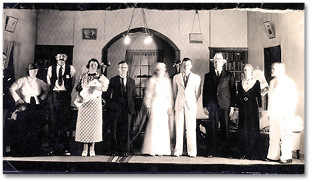 Theater productions were part of the community life at the leprosarium at Carville. The Health Resources and Services Administration assumed federal responsibility for the management and operation of the Carville facility in 1982. Scollard said what was once considered a curse from God because of sin is now treated on an outpatient basis, and if treated early, many patients live normal lives. He said complications from the disease come when people delay going to the doctor or doctors misdiagnose it because they still think of it as an ancient biblical disease. To dispel such misconceptions, people such as Jose Ramirez Jr., a former patient at Carville, dedicate their lives educating people about Hansen’s disease and advocating for people affected by it. Ramirez was 20 years old in 1968 when he was diagnosed with Hansen’s disease in Laredo, Texas and brought to Carville in a hearse. His family was devastated, especially his mother, who thought she had done something wrong that led to him having the disease. He had plans for his life, and he and his childhood sweetheart, Magdalena, whom he later married, struggled with the meaning of everything that had happened. It was thought that he would die. The Daughters of Charity and the Carville community became family and played a big role in the ongoing physical, psychological and spiritual healing for Ramirez. The sisters were forthright in providing information, comfort and friendship for Ramirez and his family. “They made him feel like it was going to be all right, that he would be able to accomplish the goals he wanted to accomplish before he was diagnosed,” said Magdalena Ramirez. While living at Carville, Ramirez earned his degree in social work from LSU, and, combining the research with personal experience, is working to eradicate the stigma of the disease. He is the author of “Squint: My Journey with Leprosy,” and is managing editor of The Star, a magazine dedicated to publishing the truth about Hansen’s disease. Schexnyder and Scollard credited the sisters with helping Carville become a self-sustaining community full of hope for those patients facing such a blight on their health and entire lives.